The order Boletales consists of a large number of genera and about 1000 species. 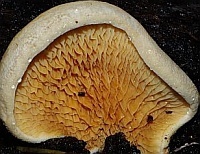 The order consists of species with a typical 'mushroom' form with stipe and cap mostly with pores but some have gills as well as intermediate forms between the two. 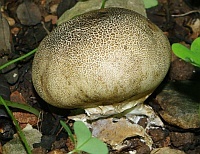 Other genera are puffball-like or with toothed caps and a single species which is polypore-like . 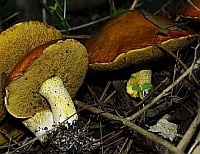 Many species of 'boletes' are mycorrhizal. The family Boletaceae consists of species which on the underside of the cap have a series of pores or tubes rather than gills. 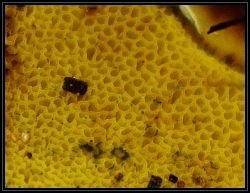 The spores are matured inside the pores and eventually drop from these tubes. Members of Boletus usually have some form of ornamentation on the stipe. 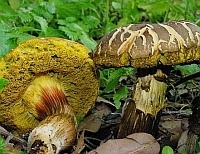 The family Suillaceae is a small family of mushrooms consisting of some 50 species, many of which belong to the genus Suillus. Members of Suillus are ectomycorrhizal with coniferous trees. 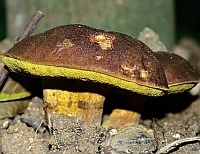 In general Suillus species are slimy or sticky in moist conditions.